A gold medal winner at the Gina Bachauer International Piano Competition, Cédric Pescia is a specialist in Romantic piano repertoire, and Beethoven's final three piano sonatas are a fitting vehicle for the Swiss-French artist's talents. A piece alternating between tenderness and fury, the Piano Sonata no. 30, op. 109, is handled with aplomb here by Pescia, who is also in complete control in the third movement of the Piano Sonata no. 31, op. 110, which begins in quiet melancholy but culminates in a dramatic fugue. One of Beethoven's most perfect works, the Piano Sonata no. 32, op. 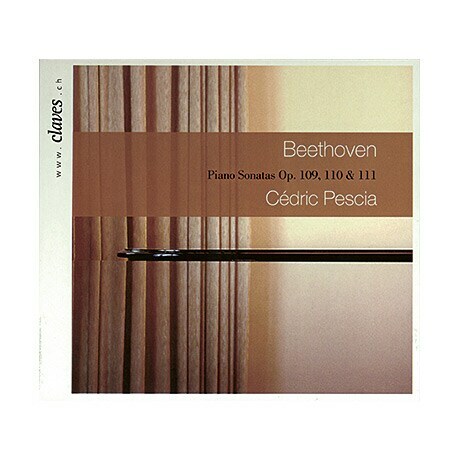 111, combines a stormy first movement and a conclusion of heavenly calm, both played poetically on this 2009 disc.